I don’t think many Indians will be offended if I say that they have a very loose relationship with time. For Westerners used to deadlines and punctuality it can be a bit frustrating to realize that if you live in India, you will never again have a meeting start on time or see almost anything completed when it originally was supposed to be. Most people here would just say, “that’s how it is here. You decided to live here. Deal with it.” And I do. Most of the time it drives me a bit crazy. Other times it leads to incredible amusement. I bring all this up because in the time that I have been working on my film with the domestic violence prevention center in Dharavi, nothing has happened on time. The women I am following are incredible, hard-working, defiant, and always — always — late. When they’re not late they are re-scheduling or pushing things back. It’s not laziness or avoidance or procrastination. It’s just the way things are done. But when you’re making a film it can get a little bit tiresome. For every day we’ve planned to film, at least half have been rescheduled. All have started at least half an hour or an hour late. But, as everyone reminds me, this is how it is here. You can’t change the system you chose to work in. I bring all this up because we are finally done filming. After two months of discussions, two months of shadowing and research, one broken hard drive and three months of filming (whenever we could), we were ready to finish up with one last meeting before starting to edit. I needed video of a game the women sometimes use as a tool for discussion so we had set up a meeting to film it. And I should have known that for my last foray I would get to go out with a bang. I arrived in Dharavi by myself because my translator couldn’t make it – after all, this was the third time this particular meeting had been rescheduled and she had another work commitment. But since it was just a meeting (ie: no interviews) I figured I could watch and film on my own, and S, the woman I was following that day, has an English-speaking husband. The meeting was supposed to start at 3:30. When I got there I called S’s husband. He said they were running half an hour late and to just go their house. I’d been there before for the interviews so I made my way into the winding lanes of their neighborhood. Normally when I go into residential Dharavi I’m with my translator or one of the women we’re following. Going alone makes me a little bit like a circus freak. Everyone stops and stares and wonders what this odd white person is doing making her way through the narrow passages and thin sidewalks. I imagine most assume I’m lost. But eventually I make it to S’s house and climb the rickety vertical ladder that leads up to her one-room home. My head popped up through the entry-way and I saw four little faces staring back at me. S’s children, hanging out at home alone, were suddenly very interested in the person coming through their trap-door. “You are aware my mother is not here?” I looked over at S’s eldest daughter N. The last time we met, when I was interviewing S, she hadn’t let on that she knew English. I tilted my head and looked at this tiny ten year old with two white bows on either side of her head. She was clearly responsible for watching all her younger siblings in their small 6 foot by 8 foot house with just a small television to entertain them. “I’m learning it in government school. I’m good at it,” she said, while looking me up and down. She didn’t say anything else, she just continued to watch me, as though she was wondering what I’d do next. I decided to start setting up my camera since she didn’t have any more questions. After a minute, she asked, “your phone is very expensive, yes?” I looked down at the iPhone in my hand. It’s hard to explain to people here that you can get it cheaply in the US – in India it costs around $800. But then, even spending $99 on a phone would be expensive here. I didn’t know how to respond so I just handed it over to her, so she could play with it. She pushed the button and looked intently at the screen. “Who is this?” she asked, about the picture that comes up when you first turn on my phone. “Your mother has very yellow hair. Why don’t you have yellow hair?” I didn’t really know how to answer, but it didn’t seem to matter. N had already figured out how to slide the phone to show the main screen and she was scrolling through my apps, clicking on different games. I turned back to the camera. I hadn’t noticed that N’s siblings were fascinated with the camera sitting on its tripod. N indicated that they wanted to take photos so I switched the camera into photo mode and showed them what button to press. I sat back and watched. N was absorbed in a card game on my phone while her siblings giggled away taking photos. Most of the time they were standing too close to the camera, but the flash and the resulting blurry picture usually made them laugh more. After awhile I looked up at the clock. It was 4:15, already 45 minutes had gone by and no one was here. “What is this picture?” N asked, snapping me out of my thoughts. I looked over. She had opened the folder that contained all the photos I’d taken with my camera. She was holding up a picture of Phoebe. “That’s my dog,” I replied. “She is cute,” she said, while laughing a little bit at the picture. N proceeded to go through all my pictures. She wanted to know why I had taken every one. Why do I take so many photos of flowers? (I like to email them to my mom). Why does my dog look different in these pictures? (she had a haircut). Who is that person and where are you? (I’m on a beach with my brother). Is that a picture of your mother when she was younger? (No, that’s my sister). Is that what snow looks like? (Yes, it is). She got the most amusement out of a video of my friend’s dog I had taken at Christmas. The dog is a french bulldog and N seemed to think she resembled a cat. She had all sorts of questions about the size of the dog, why its ears were like a cat, why it was jumping around so much. I tried to answer every one but I just kept thinking that this girl was really something. I’ve been in enough schools to know that she probably sits in a class with crumbling walls and 40 students packed in with one teacher. And yet she’s managed to learn almost perfect English by an age when a lot of girls have already been taken out of school. Here she was, wanting to understand every photo of this strange life of a person entirely foreign to her. I couldn’t help feeling like it all wasn’t fair – an inquisitive young girl in the US would have every chance in the world. I wondered whether she’d even be allowed to grow up and avoid getting married so young like her mother and perhaps even go to college. Maybe since her mother works with a progressive organization she’ll be able to push her daughter out of the cycle. But of course, all the dramatic thoughts going on in my head were once again interrupted by a question. “I like this camera on your phone. Can I take a picture of you and my sister?” I agreed and her four year old sister sidled up next to me on the table where I was perched. N snapped the photo and both she and her sister giggled with delight. “Do you have email?” I asked. “I can send it to you?” N shook her head. I was liking her optimism. By now it was almost 5pm and I was about to call S again. But a few women started arriving and filling up the room. Within a few minutes the small room was holding eighteen women and seven children. When they started the meeting I knew I needed to begin filming, so I lifted a child off my lap and uncrossed my legs. Two women had been sitting next to me on top of the table and their legs were crossed and over mine, so I had to extricate myself. There was no personal space and I had to sort of smash myself up against the wall in order to try and get the camera to see the whole room. N still had my phone and when I looked over she was showing the video of my friend’s dog to one of the women. It was 5:30pm by the time we started filming, two hours late. But at least on this occasion, I’d certainly had an interesting time waiting. I’ve been really lucky — through my various film projects and Book of My Own- to be able to spend time in many different kinds of schools in India. But few stand out like the one I went to today. A friend of mine works for an organization called Mumbai Mobile Creches, and she suggested that Book of My Own do a donation at one of their schools (If you didn’t read about Book of My Own before, click here for a previous blog about it). Mumbai Mobile Creches is a particularly special organization because they are looking out for the children who probably have one of the hardest upbringings imaginable – in slums on construction sites. When you drive around Mumbai you can’t miss the shells of empty, growing buildings around you. Everywhere you look another skyscraper is rising from the ground, aided by giant cranes that take over the skyline. The city is expanding as quickly as could be imagined and it seems like the construction is never-ending. One of the untold stories of all this construction is the slums that pop up around the building in order to accommodate the influx of migrant laborers that work on-site. 30 million Indians live like this. They move from site to site, shifting their homes every few years after they’ve built homes or offices for someone else. And it’s often entire families that are along for the ride. What Mumbai Mobile Creches does is set up daycare, pre-school and primary school on the grounds of the construction site. Often they put the school in the building itself, as it is being built. The kids learn Hindi and English, they’re given three meals a day (a life-saver for many parents) and a doctor visits frequently to make sure the children have adequate medical attention. Essentially, they’re creating a life and a community for those who otherwise might have nothing. I was excited that Book of My Own could give back a little bit to this organization and the kids they are serving. Books in hand, we drove into the construction site that held one of the schools – on the site three thirty-story concrete buildings stood half-completed. The school was in its own stand-alone building. The classrooms were painted with charts similar to the kinds you would see hanging in a school at home, only these were more permanent. It was a good attempt to brighten up and liven the rooms. As soon as we walked in the kids were curious. But once we started laying out books a group crowded around to see. The floodgates burst when we finally let them in the room. They rushed over to the wide pile of books to start finding the one they wanted. They all carefully surveyed the books, walking around them and staring at covers before gingerly picking one up and flipping through. The students were different ages and different reading skills. Some were only mastering the English alphabet. Others could manage basic reading. But all were excitedly trying to decide which book to take. I love watching the kids pick out their books and seeing what they love about them. Some like the more tactile books – with pop-ups or different materials. Others are attracted to pictures. Some love the particular stories, if they can read that much. But I don’t think I’ll ever get used to watching how excited these kids get over a book. After the first round some of the kids went to swap and found new ones. Eventually they started putting them back in the original pile. I didn’t understand — but apparently they didn’t really grasp the concept of keeping the book. They thought they’d have to give them back. We explained that they each got one book to take home. One of the teachers started handing out books without looking at which ones they were, but I insisted that the kids pick the books out, again, themselves. One girl started searching and could not find the book she wanted. My friend who works for Mumbai Mobile Creches asked her which one she was looking for, and she started jumping up and down like Tigger. We immediately located the Winnie The Pooh book she had been looking for. With a round of ‘goodbyes’ from the teachers and children we left, our box of books much lighter than when we began. I craned my neck to look up at the huge concrete buildings and really appreciated being able to be part of this incredible program for just a day. I’m having a difficult time moving my body today. And no, it has nothing to do with my recent illness. It really mostly has to do with my own sad un-athleticism and lack of doing anything remotely representing a workout for years and years of my life. That is, of course, until Daniel and I started yoga. When you move to India, everyone seems to think that the natural thing to pick up is yoga – why not learn about America’s favorite Indian import in the land of yoga itself? But for a long time I avoided doing yoga much like I’ve avoided doing anything athletic my whole life. As a New Yorker you can convince yourself that you don’t need to work out because you walk so much. And for me this was always a bit true – I’d walk the dog every morning and night. I’d walk to and from work. I kept up a brisk pace in all this walking. It seemed to me like I was moving enough to avoid a gym. But in Mumbai, there’s not a lot of walking. There aren’t a lot of places to take a stroll. And even when you are near a place you could stroll, the weather (monsoon or extreme heat) usually makes it seem sort of unappealing. So Daniel and I both agreed, after living here for some time, that we needed to try something in order to not resemble the elderly when walking up a flight of stairs. Yoga it is. To avoid extreme embarrassment we agreed it would be best to have a teacher come to the house. Luckily here that ends up being cheaper than most large yoga classes you’d find in New York. On recommendation from a friend we were put in touch with Niranjan, a yogi who specializes in private instruction. We agreed he would come four times a wee, whip us into shape and perhaps give us a little enlightenment. He showed up for the first class and we introduced ourselves. Phoebe was jumping around excitedly, as she always does when a new person arrives, and he leaned down very slowly and calmly to pat her. He quietly asked if we were ready and then led the way. He certainly had the demeanor of a yogi – every step seemed deliberate; every move was fluid. I began to think that he was in for a big treat with us. Phoebe found this all quite a bit more exhilarating than we did. She didn’t grasp the seriousness of what was going on, but to her it seemed like one big game. With every move or position change she’d try to lick our faces or sit on the yoga mat or run in circles expecting us to follow. She sized up Niranjan and would only sit quietly next to him, looking up and hoping he would give her another pat. She certainly didn’t understand why her parents looked so tired and strained. I’m sure Niranjan began wondering very early on whether the pathetic white people with the overly-excitable dog could ever really accomplish anything. By the end of the first lesson I was starting to look forward to the asana where you lie flat before going into ‘cobra’ pose. My arms were like jelly and my legs were stretched to a point where it was tiring just to stand. Our ‘Yoga for beginners’ is not an easy route to greater flexibility and balance. It is an all-out full-body workout with an instructor who corrects us when we’re trying to cheat and and ensures us that we actually can go into our sixth mountain pose, even if we’d rather just lie down and take a nap. He does this all while maintaining his unbelievable air of calm and demonstrates every pose that is being done incorrectly with indescribable ease. By the third lesson Niranjan seemed to beleive that we had already begun to improve flexibility. “Look at how much further you can go toward your toes?” he said as I leaned over, grasping more for my calves than my toes. He put his hand on my back and pushed me to try a little harder, grab a little further. Daniel was able to cross his legs without the pillow. I know these are not drastic improvements. I was still winded by the end and my body still hurts today. But slowly, with a lot of practice and a lot of help, I think we’ll get better. I’ll still probably look forward to the breathing and meditating more than the asanas, but it all comes as a package. Four mornings a week we’ll do salutations to the sun and hope we’re improving our bodies a little bit too. India style. That was certainly a phrase I didn’t know I would ever utter. Everything changed after we drove off the red dusty roads of Tamil Nadu and up into the lush mountains of Munnar in Kerala. As we drove, it seemed like the world we had just been in was slowly disappearing – the air started to clear; the language subtly changed from Tamil to Malayalam; the cows and dogs and goats that populated the streets started to look healthier; tropical plants were replaced with tea plantations and rugged trees; and of course, we lost all cell phone service. The altitude, the dramatic scenery and the windy roads felt like a new world. Munnar was like no place I’d seen in India – it is truly off the grid in every sense imaginable. In a weird way, the trees and mountains and lakes kind of reminded me of a bizarre version New Hampshire – except it wasn’t snowing in January and everyone was Indian. Except us, of course. We arrived after a long drive up into the mountains, and then onto a rocky dirt road that we could only get up with the help of an ancient 4-wheel-drive Jeep. Our hotel was in the middle of nowhere- a few houses and farms spotted the area, but otherwise it was just the hotel. Breathing in the clean, crisp air it was hard to remember we were in the same country we’d just come from. After a night’s rest and the inevitable ordering of firewood (yes, our cabin got quite cold at night! ), K and I decided that the only activity for the day could be a hike. So we set off with a guide from the hotel, who instilled a bit of initial fear when he told us to watch out for leeches. We climbed and of course I lagged behind – I always love a good reminder of how completely out of shape I am. I was a little bit embarrassed when I saw a chatty group of older women sauntering up the mountain as though it was nothing at all. We had stopped halfway up and I was watching them as they climbed. When they saw us, they giggled and took a moment to gawk at the funny white girls trying to climb up their mountain. One of them offered us a piece of fruit – it was yellow on the outside and looked like a passion-fruit. Our guide said it was okay to eat and I thanked the woman. I stood, catching my breath and eating a piece of delicious fruit- that certainly wasn’t a bad way to spend a day. As we continued to climb we eventually saw the same group of women heading down – but this time, they weren’t quite as chatty. As they came towards us I noticed they were all carrying huge, long stacks of wood on their heads. Their arms balanced the wood while their bare feet balanced their bodies down the narrowly demarcated path. They were hardly breaking a sweat. I caught the eye of the woman who had given us the fruit, and nodded. She smiled back, completely unfazed by the poundage bearing down on her head. Since moving to India I’ve been endlessly enjoying watching the ways in which people go about their days. And as I continued to pathetically huff and wheeze my way up the mountain, I couldn’t help but hope that this would be what I’d remember when I’m back in New York and totally caught up in the day-to-day pressures and expectations of my life. It’s amazing how much it feels like none of that matters when you’re so far away from it. But these thoughts dissipated as soon as we reached the top because all I could think of was sky and mountains and clouds. It was really something to see. I hate to invoke the old cliche that a picture is worth a thousand words, but in this instance I don’t even think a thousand words could do justice to the breathtaking views. 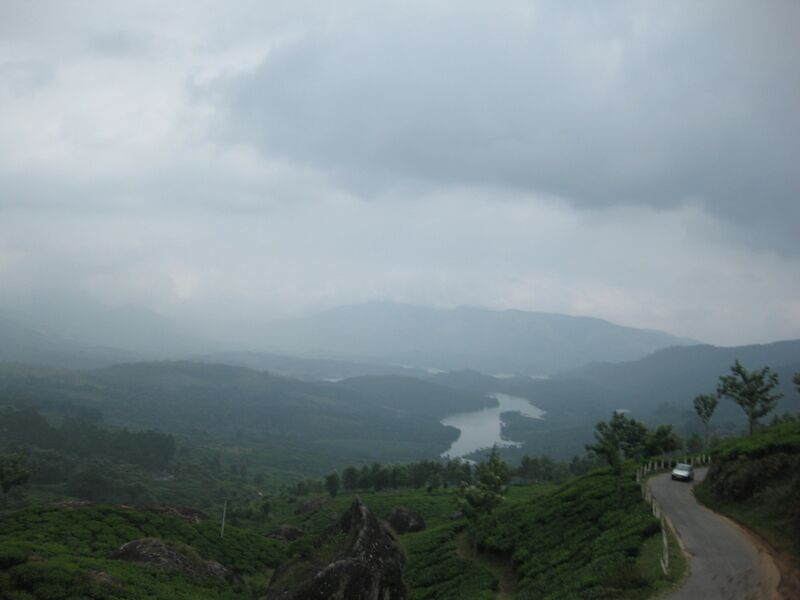 So I’ll end this post with some photos – and a true appreciation for the little slice of India called Munnar.